Gabriele Susanne Kerner (born 24 March 1960), better kent bi her stage name Nena, is a German sangster an actress. 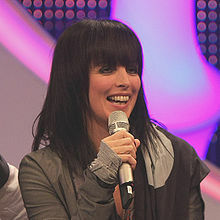 She rose tae internaitional fame in 1983 wi the New German Wave sang "99 Luftballons". In 1984, she re-recordit this sang in Inglis as "99 Red Balloons". Gabriele Susanne Kerner was born on 24 Mairch 1960 in Hagen, North Rhine-Westphalie, Wast Germany, while her family livit in the nearbi toun o Breckerfeld. She spent the earliest pairt o her bairnheid in Breckerfeld an later livit in Hagen. She acquired her elk-name, based on the Spainyie wird "nena" (colloquial for "niña"), or "little girl", the age o three, while on a vacation tae Spain wi her parents. In 1977 she left heich schuil afore graduation, an in the three follaein years she wis trained as a gowdsmith. Her musical career began in the summer of 1979 when guitarist Rainer Kitzmann affered her a position as the lead sanstger in his baund, The Stripes. The group haed a minor hit wi the song "Ecstasy", but never achievit mainstream success, an suin disbandit. In 1981 Nena an her then-boyfriend Rolf Brendel muivit tae Wast Berlin, whaur they met futur baund members, guitarist Carlo Karges, keybuird player Uwe Fahrenkrog-Petersen, an bass player Jürgen Dehmel. Thegither they formit the baund "Nena". In 1982 "Nena" released their first single, "Nur geträumt" ("Only dreamt"), which became an instant hit in Germany efter the baund appeared on the German televeesion show Musikladen. The single reportitly sauld 40,000 copies the day efter the sang appeared on the show an reached nummer twa in the German chairts. In 1983 the baund released its first album Nena, which contained the singles "Leuchtturm" ("Lighthouse") an "99 Luftballons" (the Inglis version is cried "99 Red Balloons."). "99 Luftballons" became a nummer-ane hit in Wast Germany in 1983 an went on tae major internaitional chairt success the follaein year, an Inglis version hittin nummer ane in the UK and the oreeginal German version hittin nummer twa in the Unitit States, ahint Van Halen's Jump. In 1984, Casey Kasem's radio show "American Top 40" introducit a "mixed" version o the sang, "splicing" the German an American versions thegither. It wis a huge hit in mony ither kintras an aw, an tae this day it is ane o the best-kent German rock sangs in mony pairts o the warld. Awtho "99 Luftballons" wis Nena's anerlie hit in the Inglis-speakin warld, the baund continued tae enjoy success in several European kintras in the follaein years. The baund split in 1987, an Nena went solo thareefter. Nena follae up single "Just a Dream", reached nummer 70 in the UK chairts in 1984, the B side bein cried "Indianer". A dance version o the A side totally re-written in the 90s wis released tae an unsuspectin audience an became a classic anthem in clubs. Youngsters wur unaware o the sang's oreegins. Nena stairtit datin Swiss actor Benedict Freitag shortly efter the baund separatit in 1987. Benedict is the son o the German actress Maria Becker an Austrian-Swiss actor Robert Freitag. The couple haed three childer thegither, the first bein Christopher Daniel, who wis born disabled allegedly due tae medical mistakes made durin the birth that caused Nena tae go intae cardiac arrest. He dee'd at the age o 11 months. In 1990 they haed twins, Larissa Marie an Sakias Manuel. Efter splittin wi Freitag, Nena stairtit a relationship wi drummer an muisic producer Philipp Palm frae Stuttgart, wi whom they haed twa childer, Samuel Vincent (1995), an Simeon Joel (1997). The couple an the fower childer currently live in Hamburg. On Christenmas Day 2009, Nena became a grandmither when Larissa gave birth tae a girl, Carla Maria. Anerlie twa days later, Nena's son Sakias became a faither tae a boy namit Noah. Throuoot the 1990s, Nena released a wide range o solo albums, a nummer o thaim consistin o sangs for childer. Simultaneously, she hostit several TV shows, includin Metro an Countdown Grand Prix, the German preselection for the Eurovision Song Contest, in 1998. In 2002 Nena celebratit her 20t anniversary on stage wi the album Nena feat. Nena, a disc consistin o newly arrangit recordins o her hits frae the 1980s. This album markit a "comeback" for Nena, an spawned a nummer o successful chairt entries. The remak o "Anyplace, Anywhere, Anytime" as an Inglis-German duet wi Kim Wilde wis a hit in various European kintras, reachin the Nummer 1 spot in the Netherlands an Austria, an Nummer 3 in Germany, in 2003. A DVD follaeed: the 2005 album Willst du mit mir gehn ("Do You Wanna Go with Me?") which quickly achievit platinum status. The first single frae the album, "Liebe ist" ("Love Is"), reached nummer 1 on the German chairts in early 2005, an wis the theme sang for a German telenovela, Verliebt in Berlin. Nena's 2005 tour in Germany, Austrick, an Swisserland in November an Dizember 2005 haed several sauld-oot concerts. In 2004, Nena teuk the stage durin the Howard Jones 20t Anniversary concert at Shepherd's Bush Empire in Lunnon. Nena sang "99 Luftballons", wi baith German an Inglis leerics. In 2004, Nena went on stage at the Mayday Music Festival, in Dortmund, accompaniet bi the techno duo Toktok. She sang the sang "Bang Bang", an was later joined on stage bi DJ Westbam tae sing the sang "Oldschool Baby". In October 2007, Nena released a new album entitled Cover Me, made up entirely o cover sangs. David Bowie, Rolling Stones an Rammstein are three o the baunds covered. She released the single an aw, "Ich Kann nix Dafür" ("It's not my Fault") in Aprile 2007 for the film, Vollidiot (Complete Idiot). Nena released a single for her cover o "She's a Rainbow" bi the Rolling Stones an aw. It wis released in the US an the UK an made No. 42 in the Breetish Chairts. Nena recordit an released a new version o her hit sang "99 Luftballons" in 2009 an aw, which mair closely follaes the 1980s oreeginal, in contrast tae her 2002 version. This sang wis first performit in Germany on 6 September 2009. Some pairts o the new version are in French. Nena released a new single on 4 September 2009, cried "Wir sind wahr", an a new album on the 23rd: Made in Germany. She haes developit an interest in the teachins o Indie mystic Osho (Bhagwan Shree Rajneesh) in recent years, an practises his meditation methods, an impression o which is featured in the "Wir sind wahr" video. Maist recently, she collaboratit wi the popular techno-rap airtists Die Atzen tae produce a new single, "Strobo Pop". In 2011 she contributit vocals tae the track "Let Go Tonight" bi Kevin Costner and Modern West. Besides her singin career, she haes voicit the character Saphira for the German dub o the movie Eragon an aw an the role o the Princess for the German version o Arthur and the Invisibles alangside Tokio Hotel's Bill Kaulitz. Kaulitz haes statit on mony occasions that Nena is his favourite sangster an aw. Nena is currently ane o the coaches for the Voice of Germany. In 2007, jointly wi Philipp Palm, Thomas Simmerl, an Silke Steinfadt, she foondit the Neue Schule Hamburg, a schuil follaein the Sudbury model. Nena wrote an autobiografical beuk, Willst du mit mir gehn (Do you want to go with me? ), jointly wi Claudia Thesenfitz, a jurnalist. Nena's contributions are her disparate accoonts o various episodes in her life. Maist o Thesenfitz's contributions are excerpts frae interviews o mony o Nena's friends, co-wirkers, an relatives. 2005: Willst du mit mir gehen? ↑ 3.0 3.1 Willst du mit mir gehn, Nena Kerner an Claudia Thesenfitz, Lübbe, 2005, page 182. ↑ "Nena is for the first time a grandmother" (in German). 30 December 2009. Retrieved 2010-01-17. ↑ "Zwillinge machen Nena zur Doppeloma" (in German). Die Welt. 12 January 2010. Retrieved 2010-01-17. ↑ "Nena becomes a grandmother, again". The Local. 12 January 2010. Retrieved 2010-01-17. ↑ "Kevin Costner feat. NENA – Let go tonight". Nena.de. Retrieved 2012-04-17. ↑ vom Lehn, Von Birgitta (2007-04-09). "Nena gründet eine Schule". Berliner Morgenpost. Retrieved 2009-08-30. Wikimedia Commons haes media relatit tae Nena. This page wis last eeditit on 26 Mairch 2017, at 00:49.